Watching the seasons turn never gets old. Stepping out of our hectic lives for a moment, there is something grounding about taking in the golds and reds and ambers that fill the forest, breathing in the pine scents, and listening to the crackles of animals treading on drying leaves. It’s a perfect time to take a trip away from the city, wrap up in your favourite knitwear, and explore some of Scotland’s best outdoor gems. Here at Taynmouth Marina, right in the heart of Perthshire’s “Big Tree Country”, we are perfectly placed to see Autumn sweep through the land. Around us are over 200,000 acres of woodland, home to some of tallest and oldest trees in the UK, with some beautiful walks that take you into the heart of them. Not that far from us are the Birks of Aberfeldy, named after the poem by Robbie Burns, who penned a tribute to the birks (Scots for “birch”) that look out over the Falls of Moness. Between the stunning mix of birch, oak, and ash trees, the spectacular waterfalls, and the cascading gorge, this area is incredibly photogenic. The path is well-trodden and easy to follow, with lots of easily accessible spots for the keen photographer to capture that picture-postcard scene. Literature fans might like to pay a visit to the Birnam Oak and its neighbour the Birnam Sycamore, which some say are the last trees left over from the wood made famous by Shakespeare’s Macbeth. This oak is well over 500 years old, making it one of the oldest trees in the area . . . . so ancient in fact that it is now hollow for the first three metres up and stands supported by crutches. If you are staying with us in October, a trip to the Enchanted Forest is a must. For four weeks and five weekends, Faskally Wood is transformed into an enormous sound and light installation that thousands of people travel to visit each year. Open to visitors after dark, the trees and foliage are bathed in captivating light shows specially choreographed to original music. The natural beauty of the forest is perfectly enhanced by this award-winning show, which gives an immersive experience for families to explore or the ideal setting for a romantic stroll. The surrounding countryside is a dream for anyone who loves seeking out local wildlife. You could be lucky enough to catch sight of the endangered red squirrel, which thrives in Perthshire because of all the trees that give them food to eat and places to hide from predators. They’re not shy either. There are so many woodland walks around that most of them have got pretty used to people. Autumn is a great time to try and spot them, as this is when they’ll be busy hoarding acorns and pine cones in hidey-holes on the ground ready for the winter. Of course, it always helps when tracking animals if you know what you’re looking for. One way to get the most out of exploring the local landscape is to join an expert ranger on a Highland Safari, a Land Rover adventure that takes you out into the Scottish wilderness. At this time of year, the Autumn Watch Safari is a great choice. With it being rutting season for deer, you could hear the visceral roar of a male red deer pursuing a mate, a dramatic sound if we ever heard one. You might also try a visit to the Red Deer Centre, where you can get up close with these beautiful creatures in the Red Deer Barn. After taking in all that fresh crisp air, you’ll probably want to retreat inside to enjoy some cosy comforts and hot drinks. The Watermill Bookshop, Cafe & Gallery in Aberfeldy promises both. Voted Independent Bookshop of the Year in 2008, it’s easy to spend an afternoon losing yourself amongst the converted mill’s bookshelves. Pick a new read from its eclectic mix of local interest, Scottish history, poetry, and fiction using the staff’s handwritten recommendations for guidance, then treat yourself to a homemade Gin & Tonic cake by the cafe’s open fire. Vegan, vegetarian, and gluten free options are all available on the menu too. Next, for something a little sturdier to put fire in your insides, Dewar’s Aberfeldy Distillery is just a short walk up the road. This is the only Scotch whisky distillery ever built by the Dewar’s brothers, and its long fermentation process gives its produce a golden richness renowned both as a single malt and as part of one of America’s bestselling blends. For the whisky aficionado, we can recommend the luxury whisky and chocolate tasting tour. Taking place once a day each morning (except for Sundays), guests are invited to sample three different Scotch whiskies that are carefully selected to complement an artisan single origin dark chocolate disc. Rich, smooth, and slightly honeyed – it’s an exquisite mix with a flavourful aftertaste. 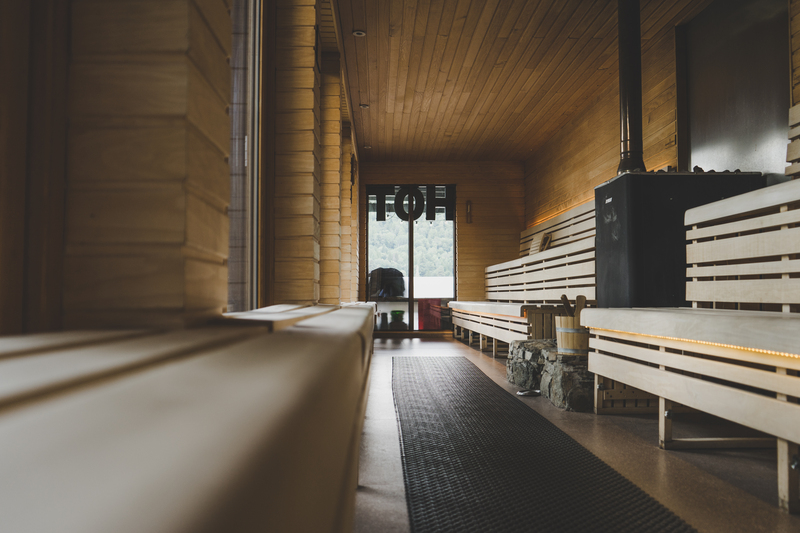 Back at Taymouth Marina, you can take full advantage of the newly brisk autumn air by winding down in our newest addition, The Hot Box Sauna. Complete with its own firepit and outdoor bar, our luxurious lochside sauna sits on the edge of Loch Tay with panoramic windows looking out over the loch to the hills beyond. It’s the perfect place to soak up the view while winding down from the day. After spending some time heating up in the sauna, we’d encourage you to jump into the freezing loch to get that invigorating spine tingling sensation. Physically and visually stimulating, it’s an idyllic place to awaken your senses . . . and somewhat addictive. previous post: Why Book at Taymouth Marina in 2018?